I happily took a detour today from my usual route after work, just so I can grab a photo of this fountain that can be found adjacent to the RER station of Port Royal. 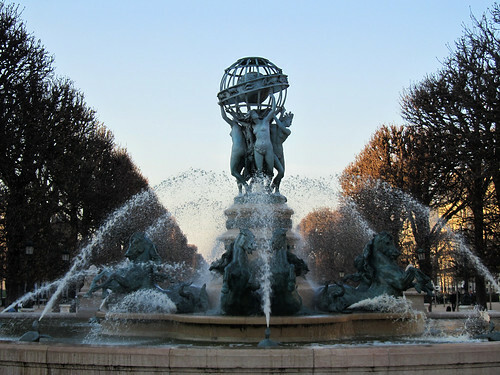 It has a couple other names, including Fontaine des Quatre-Parties-du-Monde (Fountain of the Four Parts/Corners of the World) and Fontaine Carpeaux (named after the sculptor). The four corners of the world, represented by female figures, are Asia, Europe, America and Africa. You should also be able to see the symbols of the 12 zodiac around the “equator” of the globe upheld by the figures. The sculpture itself is facing towards the observatory referred to in its name. From the Luxembourg Garden, one should be able to look southward from the central pond, and have uninterrupted view of the fountain and the observatory. Paris Meridian can be found at the observatory, which today, is still one of the largest astronomical centre in the world.